← Steampunk Adventures Some new directions and adventures! Discussion Group, what are you writing, what concerns you, what do you think of Second Life? We talk about almost anything and everything. If you want to talk about Second Life, art, music, current events, we will, or we may go off in a new direction you hadn’t expected. No matter the people in Second Life are intelligent have had alot of interesting experiences in and out of Second Life. If you love to write and would like to get feedback on your writing.. please join us! As the publisher of Steampunk Adventures an online e mag we are seeking writers, want to support new writers and will be running a literary contest. Please join me! 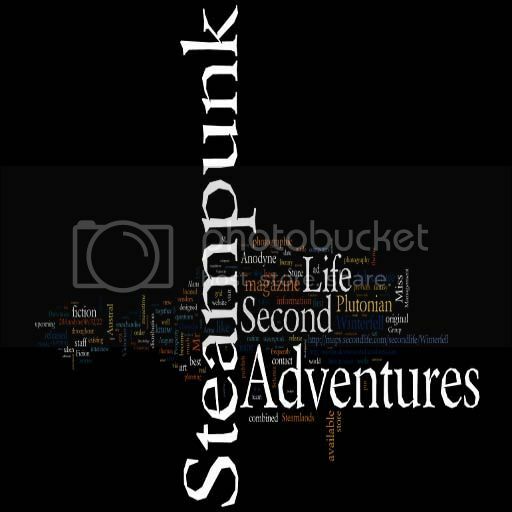 Steampunk Adventures focuses on Second Life non fiction pieces with a Steampunk Theme, Alternative and Speculative fiction, short stories, serialized fiction, and poetry.